Wondering how to make coconut butter? 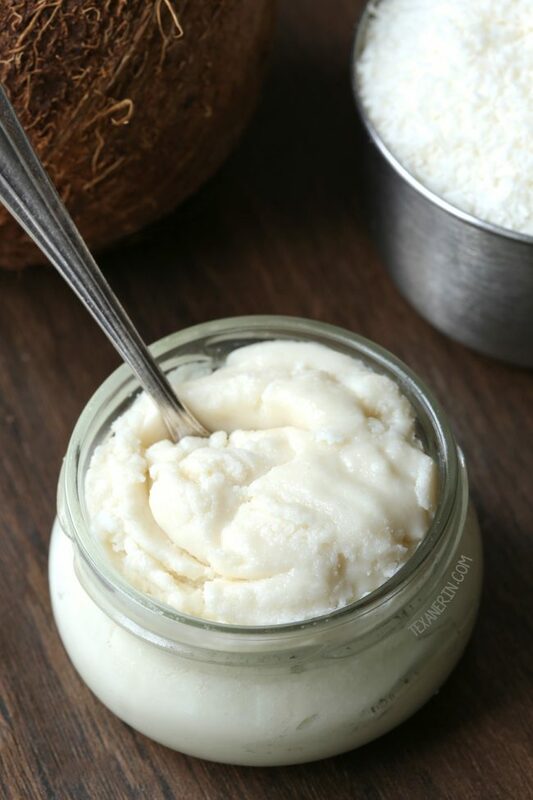 All you need is shredded coconut and a food processor or high-speed blender for this homemade coconut butter! 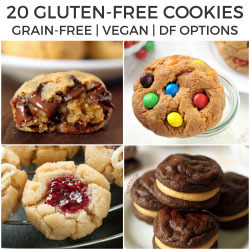 Naturally paleo, vegan, and gluten-free. With a video. A few people mentioned in my recent recipes with coconut butter that they didn’t know you could make your own. So here we go! In case you’ve never heard of or seen coconut butter before, it’s different than coconut oil. Coconut oil is the oil that is pressed out of coconut meat. And this right here? Coconut butter is just the ground up dried meat (so… shredded coconut) of a coconut. It’s not interchangeable with coconut oil or any nut butters. You have to use it in recipes that specifically call for coconut butter. Like this banana and coconut butter smoothie! If you need some ideas, try this healthy vegan peanut butter and jelly fudge or this paleo vegan chocolate fudge! You might have seen Artisana coconut butter, which is really great and indeed a little smoother than the homemade version (at least if you’re using a food processor – if you use a high-speed blender, it’s exactly as smooth). The only problem is that it’s expensive! Right now, it’s $15.65 for a 14-ounce jar on Amazon. That’s .98 an ounce. This unsweetened shredded coconut from Bob’s Red Mill is only .24 an ounce. The different names of coconut products are so confusing. You can use shredded coconut like what I linked to, and you’ll find other stuff called flaked coconut, coconut flakes and desiccated coconut. All of that works. Desiccated will just take a bit longer than the other kinds. And make sure to use unsweetened and full-fat! None of that reduced-fat stuff. What doesn’t work is coconut chips. That’s the kind that’s oven-roasted until dry and crisp. I haven’t tried making coconut butter with them but I’m pretty sure it wouldn’t work. And some brands have products that they call coconut flakes that are what I’d consider coconut chips. You see the coconut in the background of that first picture? That’s what you want. Not big, flat crunchy things. And using a fresh coconut won’t work, either. The amount of coconut you use will depend on how big your food processor or high-speed blender (a regular blender will not work! You have to use a Blendtec or Vitamix) is. You need to fill the food processor at least halfway with coconut. You’ll have a hard time processing if it’s not at least halfway full. Coconut butter stays good for ages at room temperature so don’t worry about making too much! That’s just not possible. It’s actually more of an effort for the food processor to process less than the recommended amount called for in the recipe, so I wouldn’t recommend halving it. So what are you going to do first with your homemade coconut butter? :) If it sounds too adventurous for you, here’s a post and video on how to make peanut butter! It’s just as easy as making coconut butter. Click here to view, comment or share the video on how to make coconut butter on Facebook! If using a food processor: fill the food processor at least halfway with coconut flakes. You'll have a hard time processing if it's not at least halfway full. Process until very liquidy, almost like water. Stop every few minutes to scrape down the sides and let it cool a little if it feels too warm. Don't kill your food processor! Depending on your food processor, it could take 15-20 minutes. 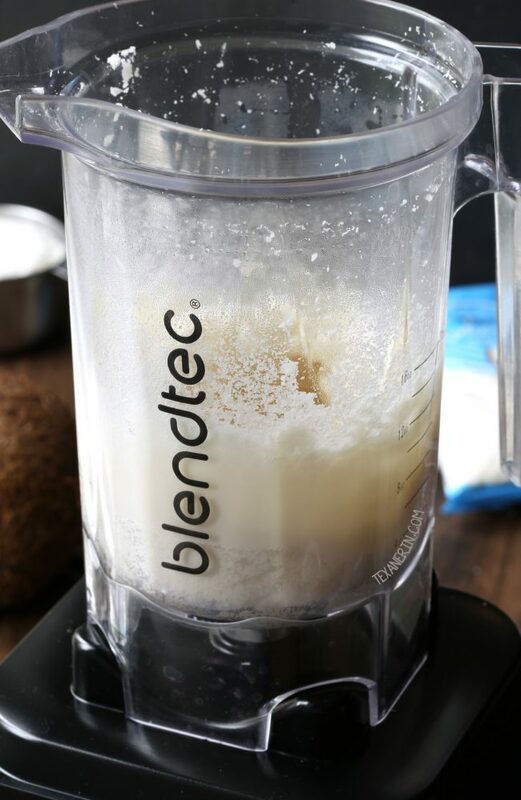 If using a Blendtec (you can also use a Vitamix), use the Twister Jar and start processing while twisting the top of the jar counterclockwise. I start off on 1 and work up to about medium power. Process until very liquidy, almost like water. It'll only take about a minute. Place in a jar and stir every hour or so until firm and solid (this may take up to 6-8 hours depending on how warm your kitchen is. If you're in a hurry, refrigerate). Store at room temperature. To soften, place the jar in hot water. 28 comments on “Homemade Coconut Butter” — Add one! 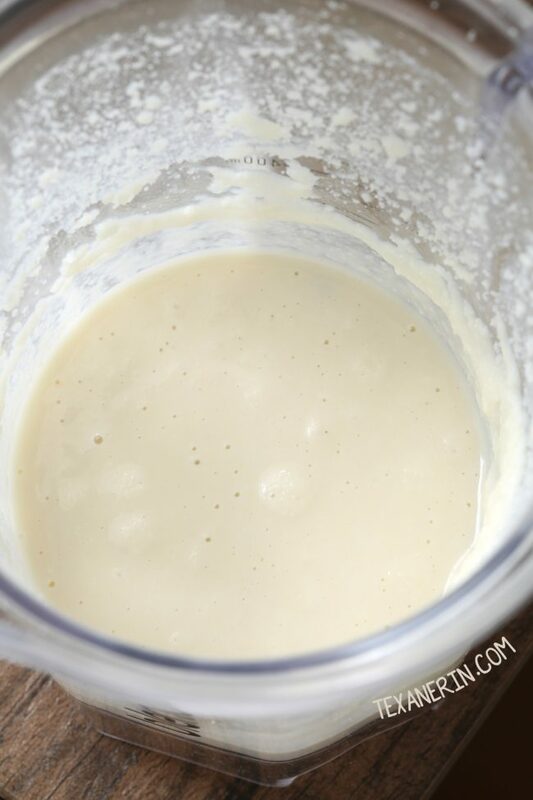 I’ve made coconut butter several times in a Nutribullet Pro, 900W motor. I’m pretty sure the standard model would never do it. Even so, I have to add 5 to 8 tablespoons of coconut oil BEFORE I start reducing it, or it just sits there and spins. Every couple of minutes you need to stop, rap it upside-down on the counter to settle the butter AWAY from the threads, then crack the seal to release the pressure. Go slowly when you crack the seal, and don’t forget to do it every few minutes or it’ll build up a dangerous amount of pressure. After about 20 minutes of run time you’ll either have coconut butter or you’ll blow the thermal fuse on the Nutribullet. Just kick back and wait 10 minutes and it’ll reset. The manna itself is pretty hot by the time it’s finished. Here’s my latest batch, done a few days ago: https://imgur.com/JWJr3aA That’s the coconut oil separating out on top; I just pour it back into the jar of oil. I started with 5 cups of shredded coconut to get 2 cups of butter. You can’t pack that much into a Nutribullet at first, you can only start with about 2-3 cups, then add the rest one cup at a time once it starts to reduce. If you’re having trouble getting it to go, add even more coconut oil. That thins it out and lubricates it, making it easier to blend. You’ll recover most of the oil later once it settles out. There’s no way my regular blender or food processor have motors powerful enough to do this. Sorry again for just now seeing your comment! Thanks for the tip on how to make coconut butter in a Nutribullet. I’m sure that’ll be a big help for the others! I’ve never used one so I have no idea what it’s capable of. My regular food processor can make coconut butter but it takes a LOT of time. Way more than the Blendtec. But I don’t have to add any oil to either one! It just takes time. Thanks again for your tips! I’m so sorry for just now seeing your comment! I didn’t realize I wouldn’t have internet at my in-laws over the holidays. :/ Coconut butter stays at room temperature for several months. Enjoy! Will this work in a Nutribullet? I have a Kitchenaid blender but it’s not that powerful for this – I don’t believe. I don’t have one so I have no idea but I googled “nutribullet coconut butter” and several people have said that they made coconut butter with it and were successful. :) I don’t think a Kitchenaid would work, either. That’s great! So happy it worked out well for you. :) Thanks for your comment and so sorry for just now seeing it! I’m in the process of moving and things are chaotic. 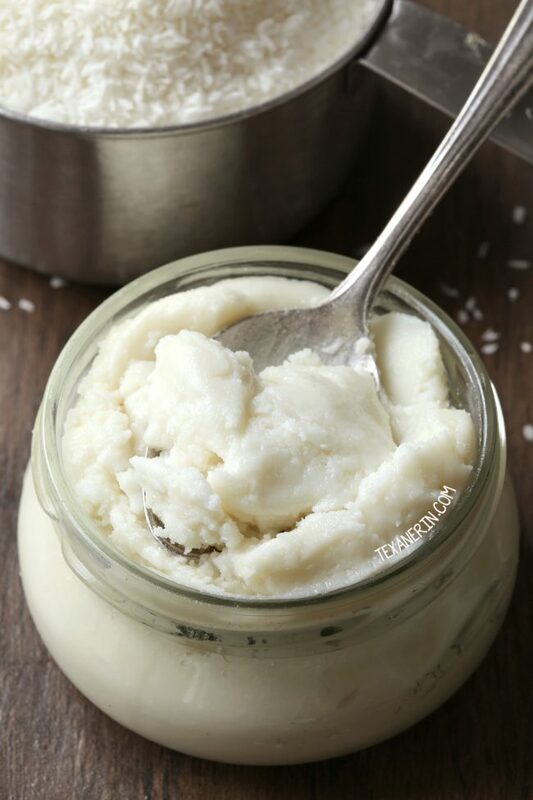 With your tips seems so easy to make homemade coconut butter! Thanks! It’s definitely worth trying out! I love that this is so easy! What a great idea and I love how super easy it is! I have to try this and make my own! Thanks for sharing! What a great idea! I’ve never used coconut butter before but this looks so easy! Love this! Coconut butter is so $$$. A homemade option sounds like a great idea! I can’t wait to try this! I use coconut oil not only in the kitchen but also for applying essential oils so we go through a lot! Note that Erin says this is different from and not interchangeable with coconut oil. I love that you’ve shown us how to do this! I’ll be trying this soon. I’ve never thought to make my own but this is brilliant! A must-try!